There are many benefits of resin flooring that make it an ideal choice for your industrial or warehouse floor. For example, did you know that the thicker resin floor types are actually harder than concrete? This article aims to help you decide whether your particular project will benefit from resin flooring or not. A resin floor is an extremely durable surface created using a blend of selected ingredients in a fast and controlled chemical reaction. Moreover, the end result is a seamless finish that’s chemically-resistant and ready to endure the harshest of environments. The properties of resins make them suitable for application on surfaces like concrete and asphalt. Polyurethane, methyl methacrylate (MMA) and epoxy are three of the most common seamless resin materials. Epoxy flooring is probably the best known type of resin flooring. It is also the most widely used, and for good reason. Epoxy flooring is made up of two main components – resins and hardeners. When combined, the resin and hardener react chemically to form a rigid plastic material. The result is a strong surface that bonds extremely well to its substrate. 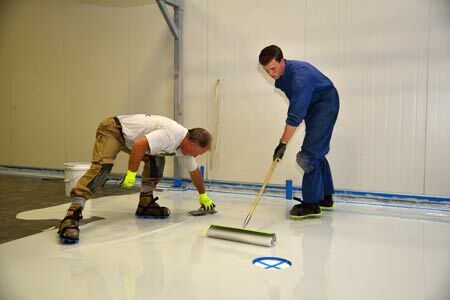 In fact, epoxy floors are so strong that they are regularly used in the most demanding environments. This includes industrial manufacturing, hospitals and sports facilities. It also the ideal choice for electrical conductive flooring. Epoxy flooring systems give off low odour and are vapour permeable with excellent dust proofing qualities. Our most popular installation option is seamless epoxy flooring. Partly because there is a wide variety of colours and formulations to choose from. What Is Resin Flooring suitable for? As mentioned previously, resin flooring is extremely versatile and can suit a multitude of applications. Apart from its flexibility, resin floors have a number of other major benefits. Resin floors don’t harbour bacteria. Thus they are perfect for pharmaceuticals and research and development buildings. There is no need for expensive and specific cleaners. Therefore you can clean resin floors quickly and easily. Suitable for heavy traffic areas and areas that utilise heavy machinery. Hence resin floors are stronger and much more resistant to cracks, chip, and cuts. Spill a variety of different substances on top of the floor without having any concern for whether the floor will show signs of damage. Specifically, resin flooring’s unique sealant component protects it against water and other types of moisture damage. Resin flooring is slip-resistant, making it perfect for hospitals and other healthcare facilities. The resin itself has about a 20-minute working time. It typically takes a team of three people to roll out between 500 to 600 square metres in about two hours. Resin flooring emits no harmful fumes that require airing out. This means after curing you can use it straight away. Compared to polished concrete, epoxy flooring costs a little less than half to install. This is due to the amount of surface preparation and time to polish a concrete floor. However, a polished concrete floor will last significantly longer in most applications. It is also quicker to renew and has no shutdown time, since there is nothing to cure. This is another reason to consult an expert flooring company to advise you on the most cost-effective solution. 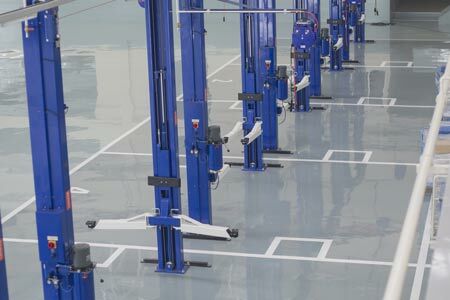 At Honestone, we install resin flooring that’s durable, serviceable, seamless and impervious and able to withstand high or cold temperatures for the industrial and commercial sector. If you are looking to get the full benefits of resin flooring, please contact us as early in your project as possible. This will enable us to advise you on the suitability of the intended floor and the ideal type of resin or polished concrete to use.